On Feb. 19, 2016, Rosetta’s instruments detected an outburst event from Comet 67P/Churyumov–Gerasimenko. The source was traced back to a location in the Atum region, on the comet’s large lobe, as indicated in this image. Europe's Rosetta spacecraft has captured dramatic imagery of a comet outburst that may have been caused by a landslide on the icy body. The outburst occurred Feb. 19 on Comet 67P/Churyumov-Gerasimenko, which Rosetta has been orbiting since August 2014. The spacecraft observed the eruption of gas and dust with nine of its 11 science instruments, from a distance of 21.7 miles (35 kilometers), European Space Agency (ESA) officials said. "By happy coincidence, we were pointing the majority of instruments at the comet at this time, and having these simultaneous measurements provides us with the most complete set of data on an outburst ever collected," Taylor added. The outburst began around 4:40 a.m. EST (0940 GMT) on Feb. 19, when Rosetta's wide-angle camera picked up a significant brightening of the coma — the fuzzy cloud around Comet 67P's nucleus. Rosetta’s wide-angle camera captured an outburst from the Atum region on Comet 67P/Churyumov–Gerasimenko’s large lobe on Feb. 19, 2016. The images are separated by half an hour each, covering the period 0840–1210 GMT, and as such show the comet rotating. The increased activity continued for at least the next 2 hours. During that stretch, the brightness of the ultraviolet light reflected by 67P's nucleus increased by a factor of six, and the amount of dust emitted by the comet spiked as well. Rosetta's dust counter detected nearly 200 particles over the course of a few hours on Feb. 19; the instrument recorded just three to 10 hits on other days in that month, ESA officials said. In addition, the temperature of the gas around Rosetta rose by 54 degrees Fahrenheit (30 degrees Celsius) during the outburst. 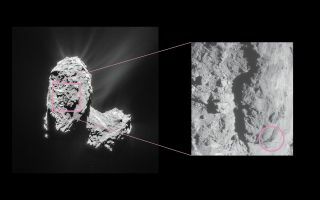 Rosetta's observations indicate that the eruption started on a steep slope in a region of the 2.5-mile-wide (4 kilometers) comet that is known as Atum, mission team members said. The activity began when this slope emerged from shadow into sunlight, suggesting that thermal stresses may have caused a landslide that exposed previously buried water ice to space. This ice then immediately sublimated (transitioned to the gas phase), taking lots of dust with it as it rocketed away, according to this hypothesis, which researchers detail in a new paper published online today (Aug. 25) in the journal Monthly Notices of the Royal Astronomical Society. "We’ll continue to analyze the data, not only to dig into the details of this particular event, but also to see if it can help us better understand the many other outbursts witnessed over the course of the mission," said Taylor, who is a co-author of the new study. "It’s great to see the instrument teams working together on the important question of how cometary outbursts are triggered." But Rosetta's pioneering work at Comet 67P is coming to an end: The orbiter will end its mission with a controlled, slow-motion crash onto the comet's surface on Sept. 30.